Manage Android phone from PC"
Note: to switch to English menu click on Android icon then select the third option from menu “English”. This is a simple application that basically comes in handy to make sure that you are able to manage and run all the smartphone applications with ease. It is a tool that supports both the import and export functions such that you are able to back up and restore the contacts lists I a database. At the same time, it is a tool that is able to run all the call logs an text messages records right from your computer or laptop. You stand a chance to basically operate your phone from the computer or laptop. Even the graphics, as well as the images, can still be seen at the computer without eve handling the phone itself. 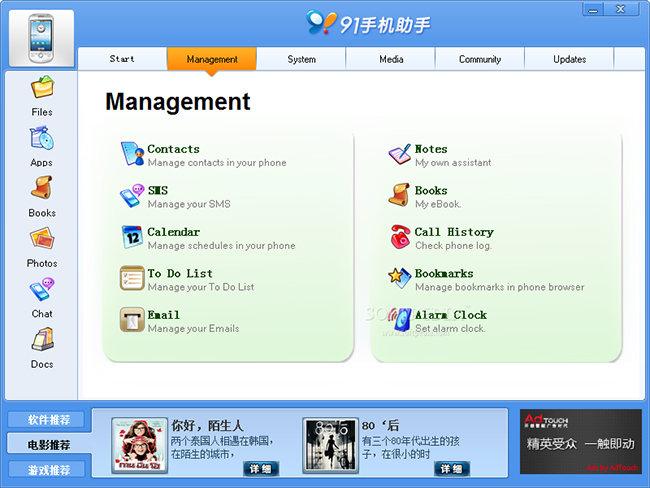 At the same time, you can check the memory of the tool in such a manner that you get the registry of the phone. Just in case you may wish to install and uninstall the application, it is something you can do with minimal effort. Just at the interface, you have a chance to run a chat function online using the online text message platform, right from the comfort of your PC. This is the best tool designed for the Android devices to make sure that you are able to manage your phone from computer. 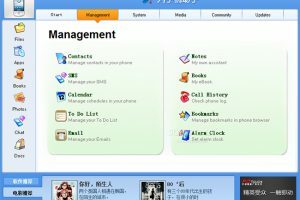 91 PC Suite for Android is licensed as freeware for PC or laptop with Windows 32 bit and 64 bit operating system. It is in tools category and is available to all software users as a free download.